A wonderful low growing perennial form Turkey and surrounding areas is Anemone blanda or 'Grecian Windflower. (see picture right). Growing from rhizomes rather than true bulbs, these spring flowering plants are from the Ranunclacae family. A versitile low growing woodland plant, a few cultivars and species are around beside the lovely blue flowering one that we know so well. 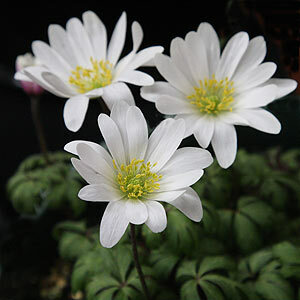 Look for Anemone blanda 'White Splendour', Anemone blanda 'Rosea' and Anemone blanda 'Blue Star'. Spreading by underground rhizomes a mature clump will look great either in the border or if you like grown in a trough or container. 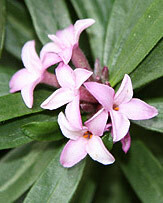 A great plant for flowers in late winter to early spring. Suited to planting beneath deciduous trees in dry shade. 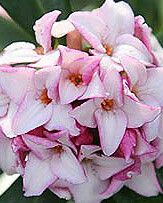 Originally from Southern Greece, Turkey and surrounding areas these plant s cope with a dry summer and form a low-growing mat of pink, blue or white flowers with fern-like foliage. Generally an easy care, hardy plant in woodland situation, this lovely little plant will spread through underground rhizomes. They do require a well drained soil with some moisture, very wet conditions over winter will be a problem. Dig over the soil, by forking the surface. You will probably only get the fork in an inch or so. Water well with a diluted liquid seaweed fertilizer or 'vermicaste tea'. Soak newly purchased Anemone blanda bulbs overnight before planting and keep moist during active growth. Gently push the small rhizomes into the loosened soil. Cover with a few inches of well rotted compost, add a little leaf mold if you have it. Water again you should see good growth in spring. 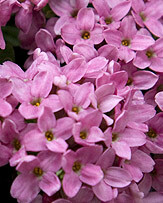 Larger clumps can be divided in summer, but best to plant the rhizomes immediately to prevent drying. 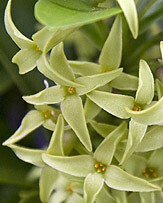 Propagation is from seed or by division of the rhizomes or tubers of established clumps. 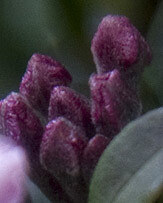 You can also grow them from seed however this is a slow and somewahet unreliable process.